I love to be surrounded by color. It energizes me and makes me smile...:) So, it's a natural fit that Homer Laughlin's Fiesta dishes are my favorite dishes for everyday use as well as collecting (vintage and discontinued pieces). 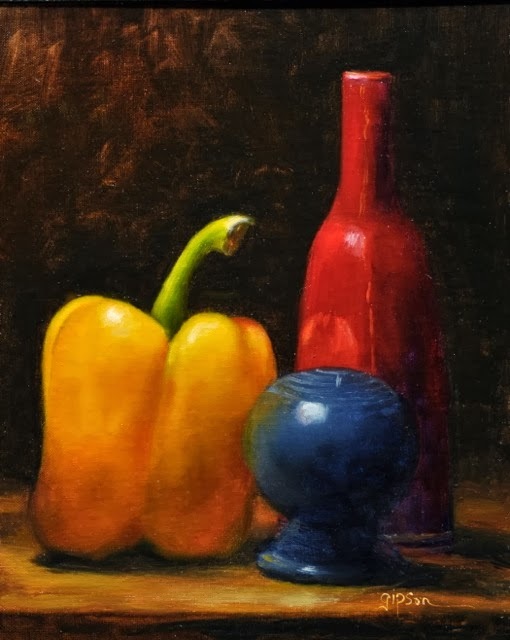 The pepper shaker in this painting is a vintage Fiesta shaker. The striking deep red pottery vase is by Mary Lee Floreschuetz, a potter who sells at Framers Gallery in Georgetown. The painting will be going to Cactus Jacks Fine Art Gallery in Gruene, Texas.